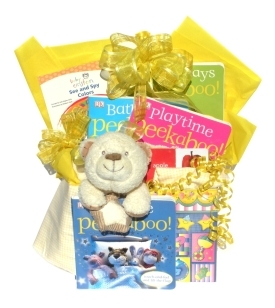 A baby book gift basket is a very unique and personal baby shower gift idea. There are online stores which sell these kind of gift baskets ready made, although I think it's a really fun gift basket to put together yourself. There are a few different ways to go about making your book gift basket as well. Here's just a few. 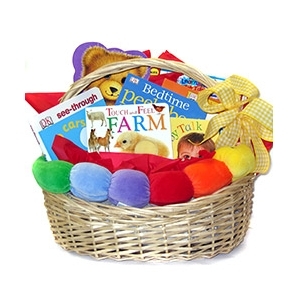 The baby memory gift basket is the kind of basket you may find at many online retail stores. These generally contain a baby memory book which you can put together yourself, as well as some other baby essentials and items. 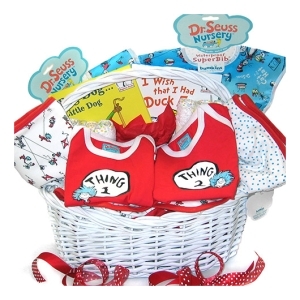 The baby bedtime reading gift basket is my personal favorite theme for a baby book gift basket. This is one I would normally make myself. I would fill a cute basket or maybe even a moses basket with all kinds of bedtime themed items including a few bedtime reading books. I love to include classic books like Winne The Pooh, Where The Wild Things Are, Dr. Seuss, and books of that nature. I then fill in the rest of the basket with items related to bedtime, such as footie pajamas, baby blankets, a night light, some soothing massage lotion, and a monitor. A baby scrapbook gift basket is perfect for any mom who really likes arts and crafts types of projects. Or really any mom who is the type to put some effort and pizzazz into her memory keeping. There are scrapbook kits out there which you can buy in baby themes, but you could also certainly put together your own kit and fill a basket with it. Add a gift card for Momma's fave film developing store, and maybe some diapers or other useful baby items. Cute outfits are always a plus too as Mom's will LOVE to dress up their babies and take lots of pictures!